Website Owner: Login to to activate your website. Click Here to get your own website online!
" Where The EAST Meets The WEST "
NEWSFLASH...WORLD BANK:China Growth to decrease to 8.25 % this year from 8.4% before ! BUT ....China decides ONLY > 7.5 %.now 7.0%.why ? "The International Monetary Fund (IMF) has changed its forecast for China's economic growth this year to 9.00 was 8.25%NOW 7.25 % percent"
CHINA decides 7.5% ....NOW WATCH THIS SPACE _+Plus___% for 2014/15..Guaranteed !! ... IMF: The GLOBAL GROWTH growth should show a decrease , it is expected to be around 3.9% was 3.5% Now 2-2.5% this year forecasted . "The International Monetary Fund (IMF)It has downgraded its forecast for UK growth from 1.1% was 0.6% NOW 0.02% this year... EU was 0.2% Now only 0.05% this year ." It Hasn't Started To Improve Todate ? So What Can We Do ...How Can We Survive In The " Upturn" ? To Maximise These Great Opportunistic Times Ahead ? KEEP IN TOUCH >>>AND WATCH THE >>REAL NEWS EMERGE !! or BE PART OF THE "GLOBAL " GROWTH PLAN FOR 2030 !! The Latest Summary Of China's Economic & Trade Statistics. Don't miss the FREE Opportunity to discuss YOUR Ideas ! China is emerging as a powerful player on the world stage. Check Out These Opportunities That Are There Waiting For YOU? Industrial production growth slowed to 17.8%, but Asian exports increasing . Consumer price inflation up to 4.8% is being controlled and monitored regularly . Property price rise of 12.8% although property bubble dampening measures already implemented and working . Prices controlled and now discounts being given , in major cities . Strengthening US$ , but no growth USA economy will see Chinese RMB moving to peg against other currencies . 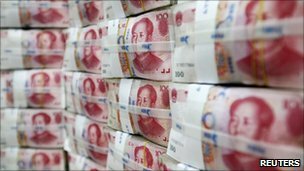 The NEW RMB agreement to Trade RMB globally is going to increase each year as the rmb increases it world stake in the world economy . South Kores , Japan and China have now formed FREE TRADE areas , the size of the EU , and Asean Partners now more closely trading than ever . .China Analysis Fourth Plenary Session, 11th National People’s Congress A Review Of Key Issues From The meeting. With its new five-year plan, unveiled in March, the Chinese government is hoping to challenge the dominance of Western technology. The plan focuses on seven strategic industries, into which it could plough as much as $1.5 trillion (£921bn) in the hope of kick-starting the economy's move up the value chain. Some of the highlights include: high-efficiency, energy-saving technologies, cloud computing, bio-technology, high-end manufacturing including aerospace, smart grids, advanced materials and composites, and electric cars. While China's market looks ever more attractive to foreign companies (total retail sales are expected to hit $10 trillion in 2020, equalling those of the eurozone), it may become even harder to break into as Chinese competitors stake out their own claims to their home markets. However, Chinese firms are actively looking to acquire the knowledge they need from abroad, which presents opportunities for nimble British companies prepared to take a chance on China. "We are seeing UK companies that are more willing to license their technology to Chinese firms," said Julian Kingsbury, the head of Intralink, a company which helps companies set up in China. " Huawei (the telecoms and technology giant) is paying royalties on licenses, and we have a number of clients actively looking to sell patents, like Qinetiq and BT. Real Questions For You To Answer In Today's Challenging Times . Q2. Have You Considered The People's Republic Of China For The Solution ? Q3. Are You Anticipating To Ride This Western Economic Recession-Depression & Gradual Upturn until 2020 & Beyond ? Q4. Have You Explored Other Links & New Opportunities, For Your Future Years Ahead ?. Q5 . Are There Companies Within CHINA, For J.V , Alliance , Partners or Avenues For Outsourcing or Sourcing Competitive Products or Services That Could Assist You? Q6 . Have You Considered Looking For Chinese Partners , Wishing To Invest In The UK and Your Company ? A. IF The Answer is YES ... YES...YES ! Then Look No Further than TCBG ! Q1. Is Your Future Link & Bridge Between East & West ? For Further Information & FREE informal discussion , Please contact us soon . Q. Who's Your Future Link & Bridge Between East & West ? To be the bridge and link between the East & West . To create co-operation and harmonious links with the East . If you find a connection here with China , a great business opportunity that you can see , then LET US KNOW @ TCBG? We will endeavour to make that opportunity happen , and be the the bridge and link to a succesful future FOR YOU . Andy Cosslett runs the biggest hotel group in China. Find out directly from him what the key is to being successful in China. No 1 Gateway Access ] Your initial enquiry , F.O.C ... NO OBLIGATION ...can be answered by email by just following the enquiry link below HEADING ..NO OBLIGATION NO1 ..thankyou. If We cannot Find The Answer ...WE Find People who CAN ..FREE ! No 2 Gateway Access ] Your general interest and information about doing trade with China , can be accessed via the regular MONTHLY Newsletter , which you can subscribe to FREE OF CHARGE , by following the link below ...In the HEADING COMPLETING ...FREE NEWSLETTER NOW ..thank you. We trust that YOU will benefit from the uptodate info on China ! We look forward to speaking to YOU soon ! ... From Tom Doctoroff Of JWT Shanghai . His 14 years in China and his wealth of experience in the Chinese market , gives you an insight into the mindset and culture of Chinese business. No 5 Gateway Access ] You know what you want , you know what you want to achieve , and you need the assistance and expertise of THE CHINA BUSINESS GATEWAY TEAM ..to make it happen with you . Please CLICK below with your specific contact details , HEADING ...READY FOR CHINA NOW & BEYOND..and we will contact YOU ...Within 24 hours .We will travel anywhere to meet YOU at a suitable agreed time , if YOU are NOWready to grasp the potential opportunities and explore your solutions to Your business NOW & Beyond . This Year & Beyond is the time to make YOUR business seen & heard in China or Your link with China to the UK ...you choose ! We look forward to hearing from you and bridging the link with the EAST, creating ALL aspects of BUSINESS or SERVICES . Creating a profitable business , sustainable business, lasting business and long term relationships with CHINA. China is the UK's second-biggest trading partner after the EU, while London is Beijing's third-biggest trade partner in the 27-nation bloc. Trade in goods for the first 10 months of 2010 hit a record high of $40.2 billion. Some 6,000 UK companies have invested in China, making Britain the biggest European investor in the country. Britain and China have signed trade deals worth £2.6bn during a visit to London by one of China's most senior politicians. ARE YOU EXPECTING TO DEVELOP BUSINESS WITH CHINA THIS YEAR ? Latest: China's Economy Grew 10.3% in 2010 and over the last decade similar percentage increase . China is expected to over take USA in global world trade in the next 5 years . Q.ARE YOU PREPARED AND READY FOR THIS ? China has raised interest rates twice in the past four months in a bid to control food and housing costs. China's gross domestic product (GDP) grew a faster-than-expected 10.3% duing the last 10 years , official statistics show. "Do your prep, do your homework and talk to people who have been there." For Further Information & FREE informal discussion , Please contact us soon. Former trade advisor Michael Johnson's number one tip is to specialise: "Don't think you can cover the whole country. Decide precisely what product or service range you're offering and then decide carefully where's the best possible place to be. HSBC predicts that by 2020 China will have no less than six provinces with an annual gross domestic product the size of Russia. Astonishing is the fact that six provinces – Guangdong, Zheijiang, Jiangsu, Shandong, Hebei and Henan – are expected to have an annual GDP of over $1,000bn within the next ten years. That puts them above countries including Russia, Canada and Spain. Unsurprisingly, all of these provinces are in the wealthy east of the country. A further 10 provinces – some of which are in the centre (for instance Sichuan) and north (for instance Inner Mongolia) of China- will have GDPs between $500bn and $1,000bn by 2020, comparable to countries such as Indonesia, South Africa and Switzerland. Clearly, China’s provinces offer a wealth of investment opportunities. Don’t assume you only have to deal with decision-makers in Beijing. You must also make sure local officials are on your side"
We look forward to hearing from you and bridging the link with the EAST, creating ALL aspects of BUSINESS or SERVICES . AT AN AMAZING PRICE ? AND YOU CAN HAVE A FREE TRAIL TOO ! If you can do word & copy plus paste , your there ! Focus on China and Hong Kong...A UKTI View On Developing Business . UKTI Market Specialist Jeremy Gordon talks about the China market, including the current challenges and opportunities for UK companies. PLEASE NOTE ..A NEW WEBSITE ... IDENTIFYING KEY PLAYERS IN CHINA IS COMING SOON ! Chinese vice-premier Li Keqiang held meetings with David Cameron, Nick Clegg and George Osborne. & SEE WHERE YOUR BUSINESS CAN BENEFIT ?